The Z is based on a well-established technology called laser induced breakdown spectroscopy (LIBS) or LIBZ as we like to call it. With LIBS, a laser is fired at a sample, heating it almost instantaneously and creating an electron plasma. As the plasma cools after about 1 us, the electrons return to the atoms that constitute the sample, emitting light at various discrete wavelengths. The spectrometer resolves the wavelengths and the processor determines elements present and concentrations. LIBZ is an optical technique, not x-ray. The measured light is in the UV, visible and NIR spectral region. Therefore many more elements can be analyzed compared to portable XRF. Elements hydrogen (H) to sodium (Na) may be measured by the Z, but cannot be measured by portable XRF. This includes critical elements like C, Li, Be, B, Na and others. The Z measures elements Mg, Si, Al at much lower detection limits, compared to portable XRF due to the optical nature of the technology. 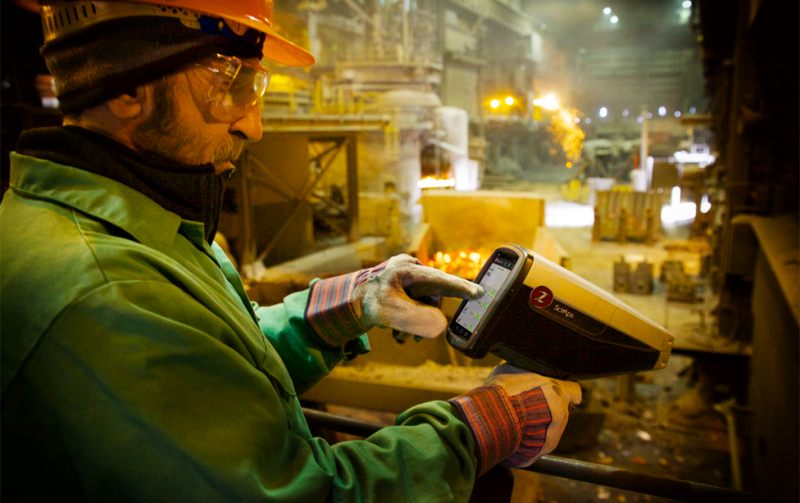 The Z-100 is the ideal analyzer for metals recycling. It offers blinding speed on the low atomic number elements including Mg, Si, Al and Be – elements that HHXRF either measures slowly or not at all. And unlike mobile OES systems, the Z-100 is a truly handheld analyzer, weighing approximately 3.5 lbs and about the size of a power drill. And it performs well on the high temp alloys. The Z100 is a smaller and lighter handheld LIBZ unit and is a great alternative for many HHXRF or portable Arc/Spark applications. It enables analysis for elements as light as Be (Z=4) and as heavy as U (Z=92); however, it does not have argon purge and will not analyze carbon (C). Provides excellent detection limits as it incorporates a high power pulsed laser, a mid range resolution spectrometer (200-550nm), and a medium sized display. The Z500 is the most advanced handheld LIBZ unit available. It enables analysis for elements as light as H (Z=1) and as heavy as U (Z=92), and provides the best possible limits of detection. It incorporates the highest power pulsed laser, the best resolution spectrometer (180-700nm), patent-pending OPTi-Purge TechnologyTM for carbon (C) analysis, and a large sized display. 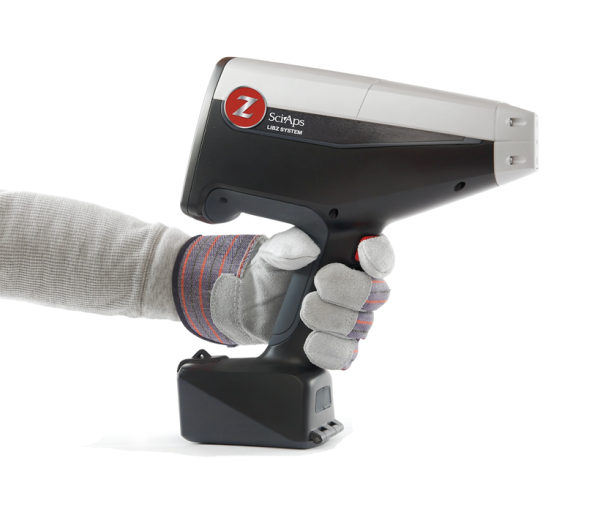 The Z features our patent-pending wide range, high resolution spectrometer. The standard configuration spans a wavelength range of 184 – 675 nm, with < 70 pm resolution where it’s needed. Alternative configuration is available to extend range up to 780 nm for analysis of O, N and other elements, or down to 175 nm for S.
The Z utilizes a 1532nm, 5mJ laser source in the eye-safe wavelength range. It meets Class 1 Regulatory Status and is therefore regulated the same as a common Laser Pointer. Eliminate those regulatory headaches due to x-ray radiation usage. The key to portability and performance! The Z features a removable argon purge that provides up to days of testing (patent pending). Testing in an inert environment is essential for emission lines below 200 nm including C, S and P. Our Opti-PurgeTM yields 10x – 50X better limits of detection depending on the element, all while preserving a handheld form factor and offering days of use under typical duty cycle. The argon canisters are integrated during analyzer use, and may be transported anywhere including aboard commercial airlines. The SciAps Z combines its high resolution camera and video capability with powerful Android features that enable photos or videos of test locations or samples to be taken and stored with results. This ability augments the power of LIBS analysis. The laser is automatically focused to < 50 µm beam size, without requiring any external, intensity-killing collimation commonly found with XRF. The Z’s camera can be used to precisely strike many types of samples. Welds can be analyzed in multiple locations when examining weld chemistry changes across the weld. The Z’s camera can hone in on particular regions for non-homogenous samples. Images are automatically saved with results for photo-documentation. And, the Android platform enables sharing of the data and high resolution images when collaborating with colleagues or reporting results. The Z features a 5” color, touchscreen display with the same pinch/zoom capability of modern Smartphones. The large display yields an easy-to-use, easy to read icon driven display. The Z features dual hot swappable lithium ion batteries. When the battery gauge indicates low remaining power, either battery can be swapped without powering down the analyzer. This eliminates any downtime due to battery changeover. 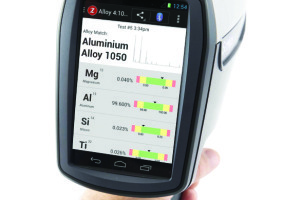 The Z delivers a better solution for alloy verification and PMI. 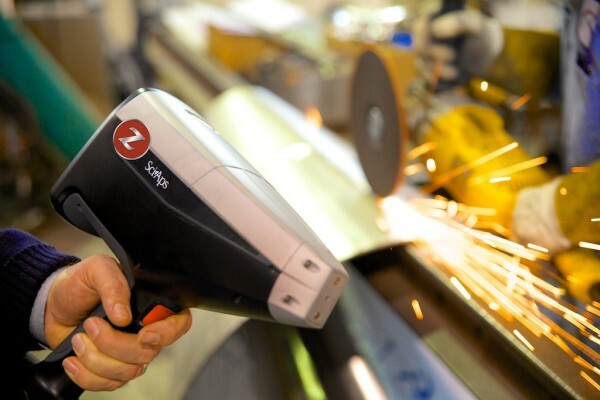 The Z technology offers the first handheld analyzer that can measure carbon content in alloys, in addition to many other elements that are critical for identifying petrochemical and power industry alloy materials. Examples abound – low silicon (down to 0.05%) in carbon steels, vanadium to distinguish P91 and more common 9 Cr, and many others. The Z yields chemistry measurements in as little as 2 seconds, and even the most difficult measurements rarely require more than 10 seconds. The Z miniaturizes laser induced breakdown spectroscopy, or LIBS. LIBS shares some similarities to optical emission spectroscopy (OES). A plasma is created by a pulsed laser, rather than a spark. Like OES, a high resolution spectrometer collects the light and creates a spectrum of wavelength versus intensity. For the Z, our patent-pending spectrometer is high resolution, wide range, and very compact. The similarities to OES end with the laser. The laser has two critical advantages: it’s pulsed, and it’s only about 50 um in diameter. It can be easily directed at a weld, and it can measure chemistry at multiple points along a weld, rather than an average. The pulsed nature produces many discrete spectra in a second. The software then applies advanced statistical methods to generate reproducible, reliable results. Such analysis isn’t done with mobile spark OES, and a highly targeted (50 um) beam isn’t possible with HHXRF due to the severe loss of x-ray intensity from beam collimation. We Make Weld Testing Easy! Testing welds with other technologies is a challenge. Spark OES is hard to control on a small weld. HHXRF requires a mask or intensity-killing beam collimation to make the x-ray beam only strike the weld area. The Z uses a pulsed laser that is approximately 50 um in diameter at the weld surface. The Z comes with an integrated camera and video (with easy viewing and reporting courtesy of Google). The targeting software allows the operator to strike a weld at a precise location. Or make multiple measurements across the heat-affected zone (HAZ) into the weld metal. For even the smallest welds, the highly focused laser can provide a concentration profile across a weld. The Z also includes an automated, 2D rastered beam, allowing for pre-determined testing patterns to be created. The Z was built to handle high-temperature surfaces. There are no fragile detectors, or easily melted polymer windows near the sample surface. Light from the plasma traverses our fused quartz window (think Pyrex baking dish toughness), and is passed down a fiber to the spectrometer. All heat sensitive components are far away from the hot surface. This design, combined with the speed of our LIBZ technology, yields excellent performance for in-service PMI. 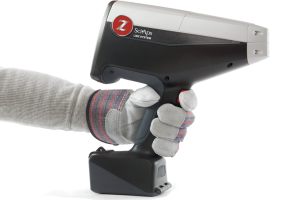 The Z offers the performance on aluminum and copper alloys of mobile OES, with the portability and speed of handheld XRF. And it also delivers the speed and analysis capability on nickel alloys, stainless and other high temp alloys that you’ve come to expect with handheld analyzers. The Z-100 is the ideal analyzer for metals recycling. It offers blinding speed on the low atomic number elements including Mg, Si, Al and Be – elements that HHXRF either measures slowly or not at all. And unlike mobile OES systems, the Z-100 is a truly handheld analyzer, weighing approximately 3.5 lbs and about the size of a power drill. And it performs well on the high temp alloys. The Z is based on a well-established technology called laser induced breakdown spectroscopy (LIBS). LIBS has been in use for more than 20 years as a benchtop and laboratory technique. SciAps has brought the technical expertise to miniaturize LIBS technology — what we call LIBZ — as well as decades of market knowledge. The result is a portable, rugged, incredibly easy to use analyzer with so many advantages over older technologies. LIBZ is fast for Mg, Al and Si, and for all your high-temp alloys like nickel, cobalt, titaniums. 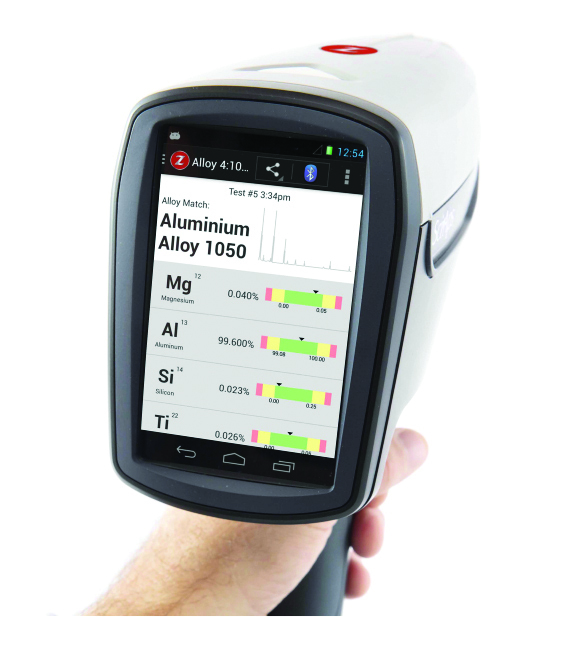 It is able to measure as low as 0.025% Mg in 2 seconds, allowing for fast, handheld analysis on every alloy you test. Compare this to handheld x-ray, which requires 30 seconds or more to test many common aluminum alloys. LIBZ measures many low atomic number elements including Li, Be, B, C that can’t be measured with any other handheld analyzer. Beryllium coppers are easy, lithium-containing aluminum scrap, and many more alloys. The SciAps LIBZ features an eye-safe laser, no x-rays. It is Class 1 – identical to a laser pointer. There’s no state regulations, no costly or time-consuming registrations. LIBZ uses optical light, not x-rays. Inside the device is a thick, quartz window – impenetrable by scrap or turnings. Optical light easily passes through transparent media, allowing the light to be piped to the back of the analyzer into a spectrometer. Compare this to x-ray, where for improved performance on Al, Si and Mg the detector must be placed very close to the front of the analyzer, behind an ultra thin polymer window. Defy the software obsolescence of other analyzers! Google’s Android platform delivers a world of data sharing, App compatibility, and connectivity to other devices – unprecedented in portable analyzers. Test results can be instantly synched with mobile devices and sent globally. 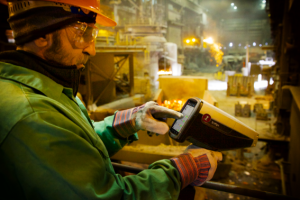 Data can be seamlessly uploaded to other devices for analysis or warehousing. The Z-500 features a large 5” color touchscreen display for easy results viewing and an intuitive icon-driven user interface. Chemistry, test results, pictures and video are all easily viewed. For more information on The Z Line please visit our Knowledge Center.